The Ukulele Scramble are Richard Perlmutter and Robin Hoffman. Richard Perlmutter, aside from playing ukulele, plays piano, guitar and mandolin. He is the creator, lyricist and featured performer of Beethoven's Wig, winner of over 50 awards, including 4 GRAMMY Award Nominations. He has also produced recordings for other artists including GRAMMY Award winning group Nickel Creek; Victoria Jackson, from Saturday Night Live; and GRAMMY Lifetime Achievement winners Ella Jenkins and Tom Paxton. Richard's songs have been made into animated films by the EMMY Award Winning Smiley Guy Studios, and he has toured nationwide and performed at the Hollywood Bowl, Grammy Museum, and Rockefeller Plaza (on the Today Show). Two collections of his songs, as well as choral editions, have been published by Alfred Music. 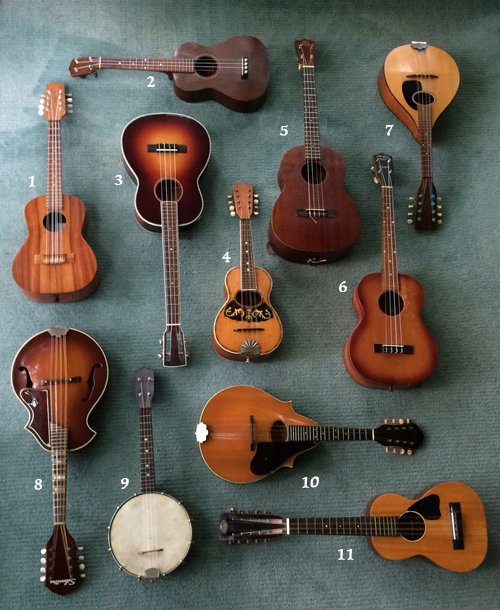 Richard’s instruments: 1, 1995 Kamaka Tenor 8-string ukulele; 2, 1953 Gibson Tenor ukulele; 3, 2015 Snowshoe Baritone ukulele; 4, 1900's Mandolinetto; 5, 1950's Favilla B-2 Baritone ukulele; 6, 1950's Vega Arthur Godfrey Baritone ukulele; 7, 1976 Martin A Style Mandolin; 8, 1950's Silvertone Florentine Mandolin; 9, 1930's Slingerland Banjo Ukulele; 10, 1952 Martin 20-S Mandolin; and 11, 1930's Regal Tiple. Robin Hoffman began playing ukulele after retiring from her career as a professional ballet dancer, with companies including the Joffrey Ballet and Metropolitan Opera Ballet. She performed throughout the United States at theaters including the Kennedy Center, the Dorothy Chandler Pavilion, and the Metropolitan Opera House. Robin is also an illustrator with two published books to her credit, Live From The Audience and Jalopy Bands – featuring on location drawings of musicians including the Carolina Chocolate Drops, Jake Shimabukuro and The Nields. She also illustrates the popular Shirley Link mystery series for middle school readers. Robin teaches ukulele in Northampton, MA, and has taught at Greenfield Community College. 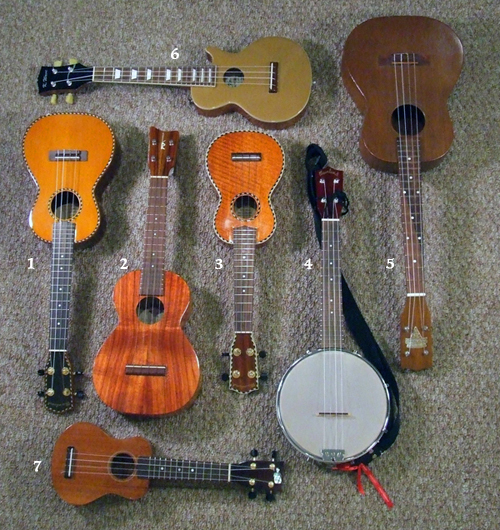 Robin's ukes: 1, 2015 Mainland Concert Red Cedar; 2, 2011 Kamaka Concert; 3, 2009 Mainland Mango Soprano; 4, 2011 Mainland Banjolele; 5, 1950's Bobby Henshaw Baritone; 6, 2000's K-Wave electric-acoustic Rock Uke; and 7, Tangi Manini Sopranino, year unknown.